I start by writing down all my cash expenses. Since I have a horrible memory, I usually jot down the details in my cell phone (26/3 – 1.30 – food @ VHS) within a few seconds of the money leaving my hands. 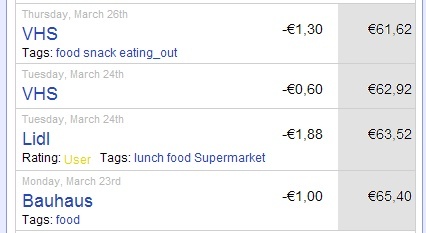 I sign in to Wesabe a couple of times per week to update my spending. If you have a twitter account and text message to burn, you can also tweet your spending directly to Wesabe and save yourself some time. 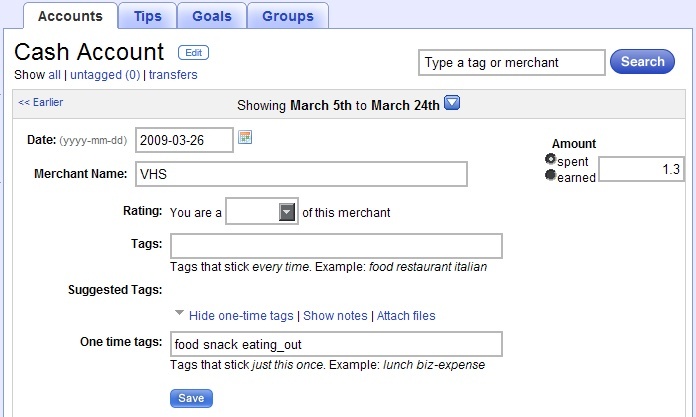 Picking good tags for your transactions allows you to look back later and easily analyze your expenses. 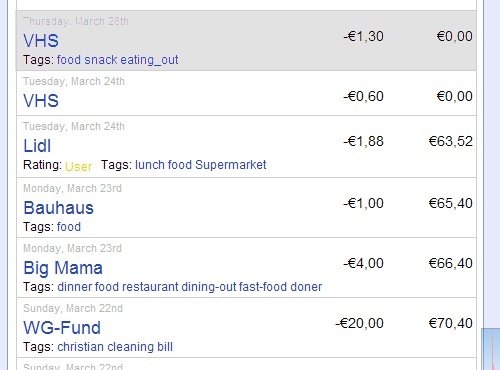 Normal tags are applied to every transaction from a merchant (all of my amazon.de transactions are tagged “shopping”), and one time tags can be used to add more detail (textbooks, lunch, birthday, etc). 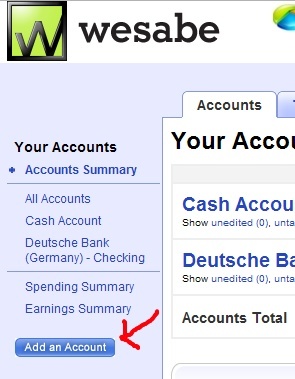 If you guys are interested in reading more, I’ll show you how to manage your bank account on Wesabe in another post. Your bank account (or credit card) probably provides a more useful picture of your spending, and Wesabe only gets better when you feed it more crunchable numbers. Do you use Wesabe for your bank account(s)/credit card(s), and if so, how do you feel about the “auto upload” feature that enters your online banking and skims your info? No matter how “safe” they say it is, I can’t help but feel it isn’t …. I also use Wesabe to keep track of my spending in my checking account. Wesabe’s auto-uploader doesn’t support my (German) bank, so I have to upload my statements manually. I’ve verified that the statements I upload don’t have any sensitive information like my account number. If you do use the auto-uploader, the reviews I’ve read have given me the impression that you’re not at much risk. That being said, if you don’t feel comfortable giving Wesabe full access to your system, don’t! 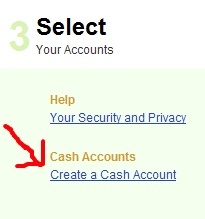 You can just manually upload your account data. I have a post in the works describing how to do just that.